Didn't everyone already know this? No one's hair looks that amazing without some help from the dark lord. 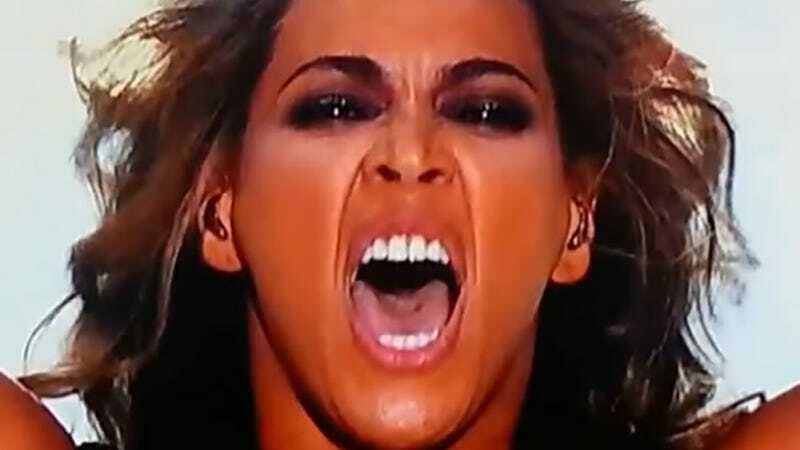 If you didn't know this —and you are going to feel so silly if you didn't — Beyonce is not just an amazing singer/dancer and mediocre actress (come at me), she's also possessed by demons and Sasha Fierce, her alter ego is actually Satan himself. Figures. You know, Beyonce isn't going to settle for some run-of-the-mill demon. #DIVA. This news comes long after reports of Beyonce being possessed at the Super Bowl (you can see a demon escaping her neck during her performance) have already been quashed by the #Beygency, but one brave man is standing up to let the world know that whatever's going on with Queen B, it isn't right and it certainly isn't holy. Kevin Swanson, host of the Generations radio program, expert on over 1,960 years of homosexual behavior —¯\_(ツ)_/¯ — and the only person smart enough to figure out that Frozen was lesbian recruitment propaganda has released the shocking revelation that Sasha Fierce is Satan and that alter-egos aren't artistic, they come straight from hell. "That's multiple personality or that's demon possession or that's psychosis - that's something," Swanson said. "People used to have to be taken off to insane asylums if they introduced other characters in their lives, these are people who are going to wind up in insane asylums, mental institutes for things like demon possession or psychosis." It's admirable that when Swanson wasn't busy boning up on homosexual history, he was able to pick up such an impressive grasp of psychology with a specific and unorthodox view of mental illness. Fortunately for those of us who have alter egos (mine is named Mama Cat), these personalities aren't actually dangerous unless they take over your life and release a bestselling album, but then you're rich even if you're possessed, so win-win? Swanson says that whatever is going on in the world today (probably the internet) is a sign of something awful that is to come. "What's shifted now, it's this incredible demonic shift, where what used to be the most devastating, the most horrific thing that could ever happen to a family, has become the highest virtue." It's not clear however, whether this statement is about gay marriage or the fact that millions worship Beyonce. I wonder if he has the same thoughts about Justin Bieber, who manages to be a little hellion even without the assistance of goblins and succubi. Now that's real talent.